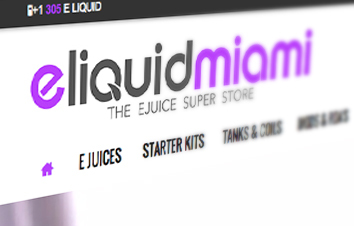 Eliquid Miami takes the vaping experience to a whole new level by helping you discover 100’s of new ejuices and products that you will absolutely love, our goal is to provide customers with excellent products, rapid delivery, great prices and superb customer service. We are a local company with a great history of success, but our business is more than just what we do; it’s about the way that we do it. It’s about who we are. impacts of conventional cigarette smoking and other tobacco use. We’re a business that’s best placed to deliver such products – after all, we believe we understand what consumers want and we market our products in that direction. Since 2012, we've constantly been sampling new electronic cigarettes merchandise and eliquids, expanding our inventory in order to bring you the latest and greatest from the e-cig industry. We understand all the different elements that smokers like about the experience they get from e-cigarettes, this means we can better meet the needs of those smokers who are seeking an alternative to traditional tobacco. The e-liquid contained in e-cigarettes delivers nicotine without smoke toxicants. Consumer research suggests that, due to being closer to the experience of smoking tobacco, they are the first product with the potential to encourage meaningful numbers of smokers to reduce or stop smoking conventional cigarettes. They could therefore play a significant role in helping to reduce the public health impact of tobacco use. We believe that if we are successful in bringing to the market a range of products that meet the needs of adult smokers seeking safer alternatives to cigarettes, this will help to meet the objectives of a number of leading public health professionals, and of course it will also make sense to our customers and us. We support a regulatory approach that puts consumer safety and product quality first. Then it’s about allowing the appropriate level of innovation, distribution and marketing to encourage growth. It also goes without saying that our marketing of e-liquid and e-cigarettes is aimed at adult smokers only. Nicotine contained in e-liquid is addictive and can be dangerous if ingested in concentrations much higher than found in cigarette smoke or e-cigarette vapors. Therefore, our e-liquid refills are sold in childproof containers, have appropriate warnings, and are clearly labeled as being for those aged 18 and over. We strongly recommend keeping products away from children and pets. Questions are also asked about the possible long-term effects of inhaling substances found in e-liquids, such as glycerol and propylene glycol. Although for more than 60 years FDA commonly approves these ingredients for use in food and medicines, we believe that more research is needed in relation to their inhalation. With over a thousand unique flavors in stock, we are south Florida eliquid super store. If you can't find it here, you won't find it anywhere else. Whether you're new to vaping or you're an old hand, our mission is to provide you with the best quality eLiquids and eCigs at the best possible prices, at eLiquid Miami you are able to stop by any of our retail locations and taste over 200 high end flavors from companies like High Rollers Sweets, Five Pawn, Cosmic Fog, Halo, Liqua, Suicide Bunny and many others. We are passionate people who love what we do and guarantee your satisfaction. We don't stock anything that we wouldn't be happy to use ourselves! We're always on the look out for new quality brands and will be adding more and more lines as time goes by. Give us a try, Call 305-eliquid!